I ran into a friend the other day at a party. She was on her way out the door to see a movie, but she looked sad. “What’s wrong?” I asked, seeing a scowl upon her face. I knew exactly what she meant. It’s such a bummer – not to mention expensive! – to go see a movie that you’re not psyched about. 2. Sugar – We got (literally) frozen out of seeing The Hurt Locker in a cinema the other night, or I’m sure I’d be posting about that here. Instead, we came home and watched Sugar. (Note to self: be sure *not* to order the X-rated film by the same name!) Sugar is a small but moving film about a kid from The Dominican Republic who gets drafted for the minor leagues and how he fares when he actually lives the American Dream. Keep an eye on this actor: Algenis Perez Soto. His face speaks volumes even though he is remarkably laconic. 3. Sherry Baby – I don’t know why Maggie Gyllenhaal wasn’t nominated for an Oscar for her performance in this film, which tells the story of a young mother who gets out of rehab and tries to resume her parenting duties. It ‘s painful to watch, but oddly heartening, and reminds you why New Jersey is such a great place to set a film. 4. The Wrestler – In an earlier post this year on why I like movies with a certain “feelbad feeling,” I singled out The Wrestler as exemplary. It tells the story of a down-and-out “has been” pro-wrestler who tries – and fails – to turn his life around by reconnecting with his estranged daughter, falling in love and leaving his profession. What I liked about this movie most was that it wasn’t afraid to have a sad ending. 5. I’ve Loved You So Long – Yep. You guessed it. Here’s another film about one person’s (often doomed) efforts to overcome the odds and turn their life around. But this one’s French (bonus) and it stars Kristin Scott Thomas (double bonus). It’s about a woman who struggles to re-connect with her family and find her place in society after spending fifteen years in prison. Well, bet you’re all feeling chipper after that round up. Anything I’m missing? 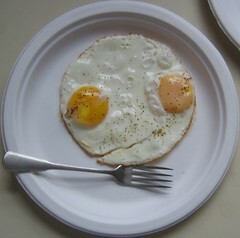 Image: Zim Eggs by World Megan via flicker under a Creative Commons License. Great films!! I especially loved the Wrestler. I loved Frozen River. Bizarre and moving but so compelling. You really worry for the characters.